Thoughts, reflections, insights, anecdotes, and experiences of a Filipino expatriate at the desert coast by the Red Sea. What else? Oh yes, it includes the faces, places, food, sounds, culture, and the everyday life! America is more polarized today than it was many decades ago. And Timothy Donald "Tim" Cook , Apple's CEO knew that its employees are likely to be polarized, too. 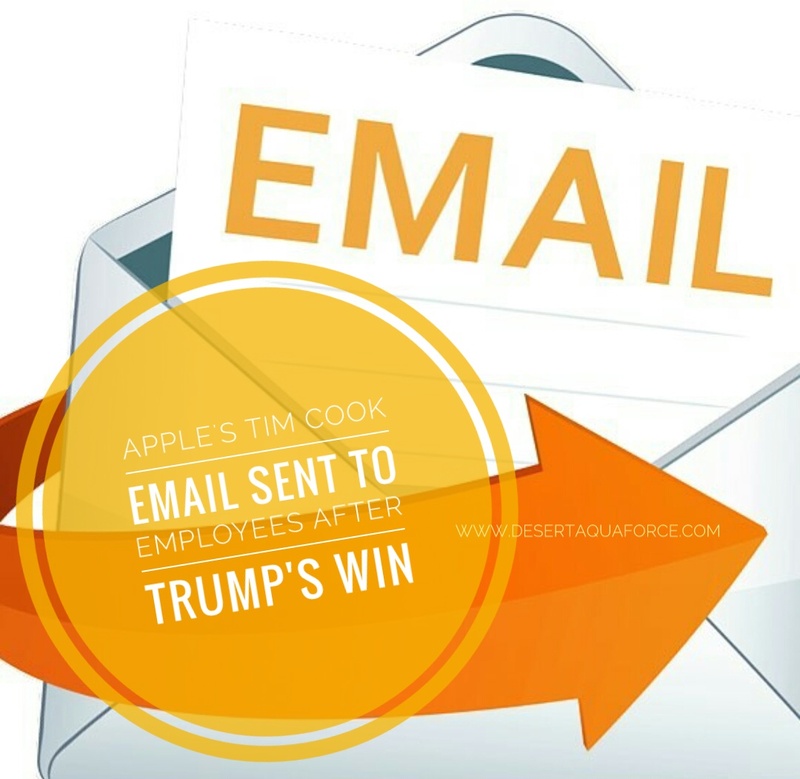 While many of its employees are still in shock at the election results, Cook wrote an email to the 76,000 US Apple employees reminding them that that "the only way to move forward is to move forward together." I've heard from many of you today about the presidential election. In a political contest where the candidates were so different and each received a similar number of popular votes, it's inevitable that the aftermath leaves many of you with strong feelings. We have a very diverse team of employees, including supporters of each of the candidates. Regardless of which candidate each of us supported as individuals, the only way to move forward is to move forward together. I recall something Dr. Martin Luther King Jr. said 50 years ago: "If you can't fly, then run. If you can't run, then walk. If you can't walk, then crawl, but whatever you do, you have to keep moving forward." This advice is timeless, and a reminder that we only do great work and improve the world by moving forward. While there is discussion today about uncertainties ahead, you can be confident that Apple's North Star hasn't changed. Our products connect people everywhere, and they provide the tools for our customers to do great things to improve their lives and the world at large. Our company is open to all, and we celebrate the diversity of our team here in the United States and around the world—regardless of what they look like, where they come from, how they worship or who they love. I've always looked at Apple as one big family and I encourage you to reach out to your coworkers if they are feeling anxious. Are you having a hard time falling asleep?